If you are a survival horror fan of games such as Resident Evil, Silent Hill, etc, and you haven’t checked out Outlast, well. You are in for a terrifying ride of your life. Many games with the horror element are not all that spooky. I find they commonly rely on gruesome scenes and jump scares rather than the psychological aspect. Outlast holds all of these – gruesome scenes, jump scares and an atmosphere and story line that is downright chilling. I was absolutely thrilled with how scary it was. As a huge survival horror and horror fan in general, to play and actually be scared was an experience. 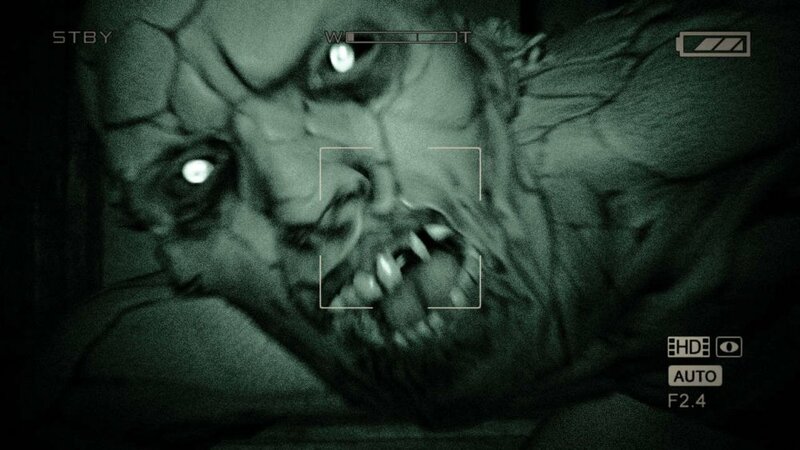 Outlast isn’t the typical survival horror game. You don’t have weapons, so you can’t shoot at enemies. All you are armed with is a cam-corder and your wits. If you want to survival, you have to run and hide. The game developers were rather nice in the abundance of hiding places, from underneath beds to hiding in lockers. Which is a literal life saver when being chased by various enemies in the game. Most of which who want to hurt and/or kill you. There are some in the asylum that are harmless, and it’s those that I feel a little bad for. They didn’t ask for this, all they want is to be left alone and treated like they matter. Might be a good idea to mention the music. Sure it’s got that horror element but my favorite piece of music has to be the chase music. Hearing that automatically sets the adrenaline going with a dash of panic and a small dose of the need to hide. I don’t think I’ve cried when running in a game before. Enemies, known as Variants in this game, are both well designed and rather intelligent. Sometimes(who am I kidding, it’s always!) it’s a good idea to look for a hiding place before continuing with an objective. Activating switches can cause a nearby Variant to investigate. There is even one that turns off the switch, forcing you to go and turn it back on. And yes, even getting chased after you do so. Fun times! Outlast; Whistle-blower was released next as DLC, and as you might expect from the name, is from the whistle-blowers point of view. The one who sent Miles the email. Whistle-blower takes place in two different stages as well. The first part of the game takes place before Outlast, then it shifts to taking place in tandem with the main game. Parts of the game show this, from the fire that burns in the main game, you see that in the DLC. Red Barrels, the creators of Outlast, are working on a sequel. It’ll take place in the same universe as Outlast but have different characters and enemies and a different setting. Which I am excited to see. I have high hopes for Outlast 2, especially the fear as the team stated in an interview that they will not release the game until they are afraid to play it themselves. So I have no doubt it’s going to be just as terrifying, or more, in the sequel. So far, very little information has been released, and I was a little bit disappointed that there was nothing at E3. With any luck, Red Barrels will release some new information regarding Outlast 2 and when that happens, you’ll be the first to know!